No matter how much I like factory tours and which companies I visit, Aston Martin Lagonda Ltd. in Gaydon will probably always be my favourite. Enter factory visit number four. One of the reasons this doesn’t get old is that each tour is different. This time we met up with Steve, who showed us around twice before and Sam, who is an apprentice. It must have been our lucky day, because the group consisted of only five people. Out of these only one had not been to the factory before. And that shifts the focus of the tour entirely. Two of the cars in the reception area. The usual programme starts with a drink in the atrium, followed by a quick overview of the company’s history and then the factory tour which typically takes up 60 to 90 minutes. This time we started the tour a little bit late, because Steve and Sam gave us some insight into their respective careers. Steve has been with the company for quite some time now and Sam is one of the many apprentices. It was very interesting to hear how progressing in a career has changed through time, but also to get further details on how the apprenticeships work – something Aston Martin is quite keen on. We also spent more time than normal at the heritage line. The boards on the wall have now been replaced by new ones, allowing space for the latest developments like the DB11 and Valkyrie. The cars on display in the line were all familiar to me, but still a very welcome sight. As one of the guests in our group has a keen interest in classic cars some interesting views were shared about classic cars, but also how the Aston Martin brand has survived where other car manufacturers have not. The ‘brand’ Aston Martin is something fairly new and possibly alien to the public. Of course AML is a car manufacturer, but it has been branching out for some time now and should now really be seen as a luxury brand. In case you are not familiar with this: you can now buy an Aston Martin powerboat, a submersible, a pram, clothes, travel accessories and much more. Actually, it has already gone as far as luxury condos! Even though we were at the factory only eight months ago, some things had changed a little. It’s quite visible that Aston Martin is a company which is moving quite quickly at the moment. For one, this was the first time we had trouble finding a parking space! As an enthusiast it’s great to see it so busy and that so much is going on. It’s quite evident from the various Aston related social media accounts as well. During the time we spent in the factory we had the luxury of discussing some current developments. On my car related social media I have not yet spoken out about the news regarding Aston Martin, Red Bull and F1. If we are to believe the media Aston Martin will be developing an engine to be used by Red Bull’s F1 team. Judging by the timeframe alone that would seem unlikely, but you’d also have to consider the amount of money that would require. In addition I have to admit that I find F1 a bit of a beast. If things go well in F1 world the fame is quite far reaching. However, if it doesn’t go well, who knows what damage will be done? As such, the entire development worries me a little and I found out that I’m by no means the only one. Of course I’m fully aware there’s only so much the public can possibly be told, but it’s to Steve’s credit that he tried to put things a bit into perspective and reduce the concerns expressed by one of the other guests and me. I think it’s sufficient to say that we should certainly keep in mind that media have not changed; you cannot take what’s printed for gospel. And somehow it is comforting to be told to ‘just trust us’. Actually, I have no issues with that at all, because in recent years it has become apparent we (the Aston Martin fans/enthusiasts) can trust the people within the company to do the right thing. One of the new developments this year is the AMR brand. It may sometimes seem difficult to understand what’s going on or where they are going (yes, I did raise my eyebrows the first time I heard about Miami), but it seems to be working out for the better. Like everyone else I will have to wait and see what comes next, but it is very clear that a lot of exciting new things will be coming our way. And I’ll be coming back for another factory tour to see it happen (a little) with my own eyes. In 2016 Aston Martin Lagonda Ltd. told the world that they would open a new site which would become the factory for the DBX. The location was an old MOD site at St Athan, Wales. In early 2017 the site is still mostly empty so the Aston Martin Owners Club took the opportunity to host their Spring Concours there. Let’s see: AMOC (very good at hosting ‘parties’), AML (very good at being at the right place at the right time) and AMHT (very good at displaying the best of Aston’s history) together at one location. Yes, that’s a must see. So off to Wales we went. AMOC hosts a Concours twice a year, once in spring and once in autumn. If, like me, you don’t know what that is: the club’s members bring their cars and these cars are judged. In short: there’s prizes up for grabs in several categories. One thing is for certain, you can expect the best examples to be there. In this case reportedly around 700 Aston Martins were present. Considering several halls were in use, each of them huge, I believe that number to be accurate. One of the halls was only beginning to fill up when this photo was taken. 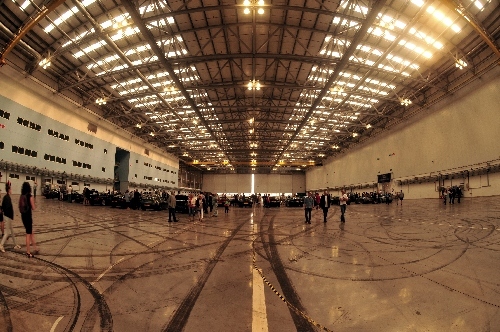 The entire hall is twice this big. The Aston Martin Heritage Trust was also there with, among others, a DBS display to celebrate this model has now been around for 50 years. As if that wasn’t enough, there were several very special cars to be seen. 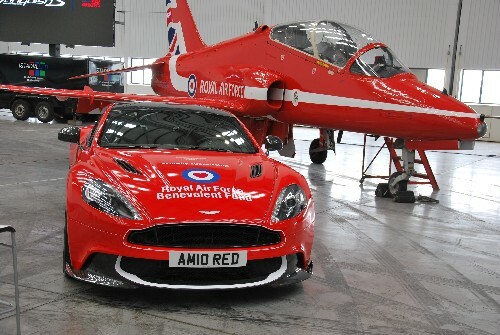 There was the unveiling of the Red Arrows Edition Aston Martin Vanquish S, while previous special editions were on display nearby. I was very happy to see the Valkyrie. Even though I had already seen her in Geneva, I thought it was very good that people who may not have had the opportunity (or the wish!) to go to Geneva now had a chance to see her to. She got a lot of attention, which is not surprising. This car is something else. My personal highlight was definitely the CC100. This car was created for the company’s centenary celebrations. Only two were made, so chances are very slim indeed to ever see this one anywhere other than in a magazine. But there it was. An added bonus is that one of the designers involved in that project was at the Concours. It is a very welcome extra being able to talk to him for a while and get his perspective on the project and the car. 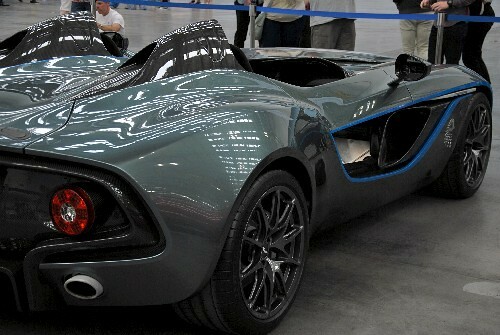 And the list doesn’t end there: DBR1, Lola Aston Martin, One-77 and the Vulcan. All present and set up in such a way that everyone had a chance to have a good look. There were several Lagondas and I even spotted two Cygnets. There was so much to see that after 4.5 hours I had to give up. Not only did I have quite a drive back home, but the sheer number of cars was a bit overwhelming. However, that drive (several hours) was very much worth it. Just think: that very same evening they probably had to clear everything out, because the next day construction on the factory started. The Concours will very likely never be held here again. It was an epic and unique event. Aston Martin factory tour no. 3…but why? A few days ago I went to Gaydon for my third factory tour there. How much can you write about an experience you have just had for the third time? Not much. So instead I decided to explore my fascination with Aston Martin Lagonda Ltd., because my love for the cars goes beyond just that. The company itself is of interest to me, which is why I have recently returned for another factory tour within a year after the previous visit. Sometimes this discussion comes up: what is it about this company that keeps me interested and makes me want to visit it so often? Most people immediately assume it’s because ‘everyone loves an underdog’. Hold on! What is an underdog exactly? An underdog is a person or group of people with less power, money, etc. than the rest of society. Well, that is certainly not true for this company, is it? I guess in the world of car manufacturers Aston Martin Lagonda Ltd. (also known as AML) is a very small company. It’s also widely known they have yet to make a profit. However, I would argue that they have a considerable status in this world (equals power?) and it probably requires quite a lot of money to manufacture the expensive cars they create (so no profit, does not equal no money). The main thing that got me hooked on this small car manufacturer is the fact they are such a commanding presence in the car world, despite being small and not being able to make a profit (yet!). Here is a company which has survived 100 years, because people believe in it. Because they don’t want to see this brand disappear. Because they want to see these cars on the road. It used to be quite normal for several people from the same families to work for Aston Martins, therefore providing generations of workers with a passion for Aston Martin. So it is apparently more than a company, a factory. It’s a family too. They used to produce only small numbers of cars. They even sold cars under production price. From an economic perspective that is unheard of. And AML did almost go bankrupt a few times in its history. Almost. Because every time there was someone who would buy it or put money into it, so it could keep on going. These guys just don’t give up. That is probably the short and narrow of it. They simply do not give up. The ceiling of the DB11. The people who put money into this company are probably not sentimental fools like me. They want something in return…or so I assume. There must be more appeal than just the company’s fighting spirit. Well, there is. I have not met many people who do not at least like Aston Martins (there are a few, believe it or not). There is something about the cars that makes heads turn. They are desirable. Even if you can’t afford one, you want one. I think the combination of style and detail is the cause of this. Aston Martin has stayed true to their heritage. You can clearly see the older models (specifically DB4 onwards) in the new ones. And yet they manage to move on into a new age. Due to some automation they are able to create more intricate designs in the interior (see photo above). The number of items you can specify on the DB11 is huge. The Aston Martin Vulcan. Even this beast has lots of typical Aston Martin features, yet it looks nothing like the classic models. It’s this same combination of old and new that draws in the more romantic among us. Yes, there are machines in the factory. Yes, there are robots. But most is still done by hand, by human beings. The atmosphere in the factory is calm, despite the noise. The people are happily (because there are quite a few smiles) going about their work. Despite the more modern way of working the factory churns out in a year what other car manufacturers produce in a day. Let’s face it: if you see two equal products and one was mass produced and the other by hand, you’d instinctively have more faith in the handmade one. And there is no equal to an Aston Martin. The factory in Gaydon is a great place to be. It is that simple. You get to ‘play’ with the cars in the atrium, you get told about the history, you get to see these wonderful cars being built by people who love building them. I’ve been three times now and I will go again, simply because I can’t get enough of it. And I want to see what this second century will bring. There have already been reports of a big turnover boost and several new models in coming years. There will be a new factory in Wales and the list of vacancies in Gaydon is ever growing. It seems AML is doing well. Hopefully we’ll see them make a profit one day.